Back to the radishes…I just love them. 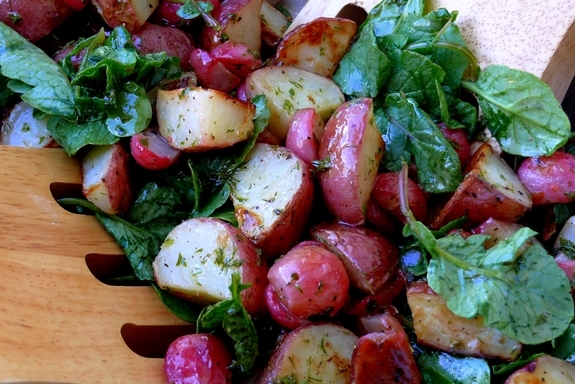 Roasting them brings on a whole different flavor that pairs so well with potatoes. We loved this salad. It’s rustic, it’s different and has a nice tangy vinaigrette. What’s nice is using the radish greens in this salad, as they are completely edible. Just remember to wash them well as they can be sandy and full of grit. This is a beautiful side dish for a Spring meal and something different! Preheat oven to 425o F with a large baking sheet inside. 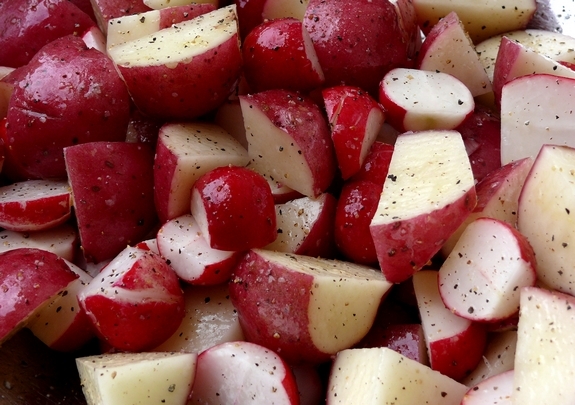 Toss radishes, potatoes, 2 Tablespoons olive oil, salt and pepper in a large bowl to coat. Transfer mixture to hot baking sheet in oven. Roast until golden, 20-25 minutes, stirring halfway through roasting. In the meantime, wash radish greens in several changes of cold water and spin dry. For the vinaigrette whisk together vinegar, 3 Tablespoons oil, Dijon, parsley and dill in a bowl until combined; season with salt and pepper. 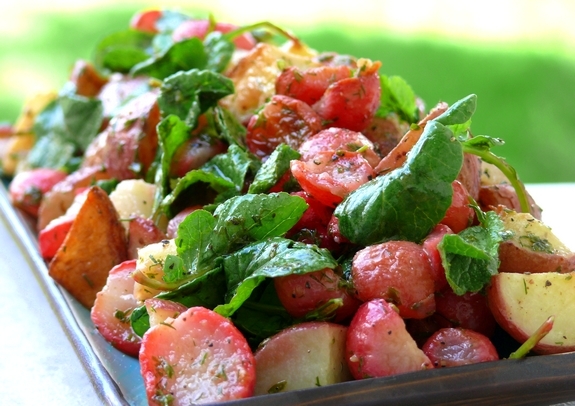 Stir radish greens into roasted radishes and potatoes and add vinaigrette. Radishes are wonderfully, especially when cooked like potatoes. I love them that way! I love radishes, but have never thought to roast them! What a great idea! I am going to definitely try this recipe! I’ve just recently discovered roasted radishes. They’re really delicious. I like them raw, but their applications seem a bit limited sometimes. Knowing that they can be roasted opens up a whole world of new uses for them. I’m not a huge radish fan but I have heard that the taste changes if they are roasted. My aunt was growing some in her backyard, I’ll have to see if she has any left. You come up with the most wonderful recipes! I’ll have to try this. As a kid, I remember my dad making radish sandwiches on rye bread. Spread a little butter on the bread, slice and add the radishes plus a little sprinkle of salt. Mmmm…memories. Oh Yum! I just saw the new article on radishes in Bon Appetit, which has me longing for them. This looks simple enough for even the newest of cooks, and oh so healthy. how perfectly timely! I bought a cluster of fat pink radishes earlier this week and wasn’t sure what to do with them. Now I can do this! I’ve always been wary of cooking them thinking they’d go all weird and soft, but yours look all crispy and delicious. Love that you also used the radish tops too! I always make the mistake of reading your blog when I’m most hungry!! I have to try radishes again. I haven’t eating one in probably 20 years. Your salad look amazing. I’ve never heard of roasting radishes before.. will have to try it.. 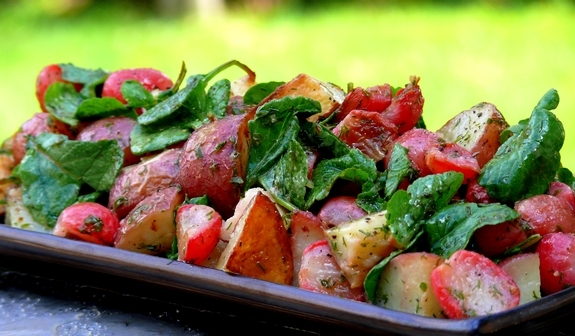 I never would have though about roasting radishes- just tried it last night with roasted potatoes- was great! Will have to try this recipe. I’m loving all your recipes- so am passing on some awards & sending people your way. See http://homestyleworldcook.blogspot.com/2011/04/more-awards.html for more info. Great job! I was just watching Iron Chef last night and the challenge was radishes. Have a wonderful Easter! Glad things are moving right along with your vineyard. I’d love to get out there sometime this summer! BEAUTIFUL! What a perfect spring salad, full of color and flavor! I love the colors of this salad. Looks very fresh & light. This looks so delicious. I’m bookmarking it for my next picnic! Well what do you know? The two main ingredients in this salad are in the house. This will be perfect for the weekend.